Those new to Pacific Poker can take advantage of a Welcome Bonus worth up to £230. It begins with the addition of 25% to the player's initial deposit instantly, even before sitting down at a table. After play begins, the remaining 75% is released as soon as 750 Bonus Points are earned. To claim the maximum bonus, £230 must be deposited at the start. Pacific Poker, one of the Internet's original online poker rooms, has been going through some changes recently, which could be characterized as a sibling identity crisis. The web site's parent company, 888 Holdings Plc, is gradually consolidating the established brand with its other holdings - namely, the 888ladies bingo web site, 888backgammon, 888sport, and 888.com, aka Casino-on-Net. The result is 888poker, which is truly a rose by any other name. Pacific Poker continues to run independently while the new proprietary software, which is licensed in Gibraltar, is phased in. Play is possible in both Download and Instant Play versions on both sites. Even as 888poker was getting set to launch, Pacific Poker's software underwent a new upgrade to Version 5.8 in February of 2010. The new application, which can still be downloaded at the Pacific Poker web site if the initial 888poker pop-up is ignored, features a number of improvements to help players enjoy their day-to-day game experience. Among the upgrades are new Buy-in and Re-buy screens for cash games (aka "ring games"). Also, new sounds have been added and some others changed, a highlight function to mark open tables in the Lobby has been enabled, and the software's language functionality has been tweaked. What has not changed is Pacific Poker's ability to deliver a high level of play at some 700+ tables. Among the ring games offered here are the four major ones: Texas Hold'em, Omaha Hi, Omaha Hi/Lo and Seven-Card Stud Hi/Lo. No Limit games of all poker versions except Seven-Card Stud Hi/Lo are available along with Pot Limit and Limited games. Play begins whenever two or more active players join a table, and the action continues 24 hours a day. Pacific Poker also has two progressive jackpots at its ring game tables. One of these is the Bad Beat Jackpot for any player who loses on a huge hand; it is loaded with an initial amount of £5,000. The other is the Royal Jackpot, which can be claimed by catching a Royal Flush; it starts at £25,000. In both cases, the more hands are played, the bigger the jackpots grow. Among tournaments offered at Pacific Poker, the impromptu Sit & Go format is quite popular and can be joined by up to 50 players. The games begin whenever a predetermined number of players register. 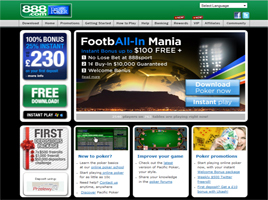 It is possible for a single player to register and actively play in as many as eight poker tournaments at one time using multiple browser windows. Buy-in amounts/fees vary, and some tournaments offer re-buys and add-ons. To locate scheduled tournaments and satellites (qualifiers) on Pacific Poker easily, all it takes is a click on the tournament tab. Registration remains open for these tournaments right up until the designated start time. Again, signing up and playing in a maximum of eight tournaments at a time is permitted. As the tournament progresses in the multi-table format, active players may be moved between the tables when others are disqualified or run out of chips. One other useful aspect of Pacific Poker is its free Poker School for beginners. Available as downloadable software in English, German, and French, the school site provides the opportunity to play with Demo Money while participating in ring games and tournaments similar to those available in the Real Money mode. Step-by-step poker lessons in animated video are also provided free of charge. New players are also invited to participate in the daily First Depositors Freeroll with a guaranteed prize pool of £3,500. On Friday evenings, the weekly £50,000 First Depositors Challenge is held, and up to 20 lucky winners from this tournament move on to Saturday's £1,000 Depositors Freeroll, which is open to all members who add funds to their account during the week. Special promotions such as "bounty hunts" and "casino mix-ups" are announced frequently. Side games such as Keno are offered, too. There are also occasional offline events organized, such as packages to Las Vegas for the World Series of Poker or the opportunity to join the World Poker Showdown Caribbean Poker Cruise.